In December of 2011 my UT colleagues and I collaborated with artist Diana Al-Hadid to fabricate a large scale sculpture commissioned by UT Visual Arts Center. 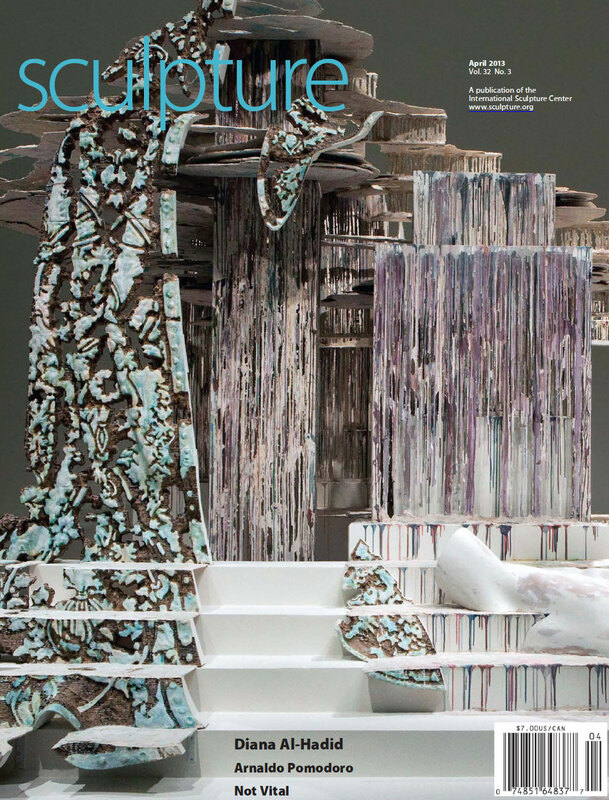 I learned recently that this sculpture, “Suspended After Image,” is featured on the April cover of Sculpture Magazine. The portion that we fabricated with our CNC router is the bluish “cloak” on the left which I also posted about here and here. Hook’em! Late in 2011, in my capacity as supervisor of The University of Texas, Texas Performing Arts Scenic Studio I had the opportunity to collaborate with an exceptional contemporary artist, Diana Al-Hadid. My responsibility was to produce the cloak using RenShape BM5440 — a truly splendid material. The annotated images below describe a little more about how this was accomplished. Diana Al-Hadid, Suspended After Image, 2012. The 6″ wide blanks of 2″ thick Renshape are clamped into the custom-made vice ready for the first layer of milling on the Shop Bot Buddy CNC router. After the first layer is milled a second layer of blanks are glued on using a Steinel hot melt polyurethane glue. I never had a glue bond break during the whole run. The third layer is carved. We could go no higher than 6.5″ without running out of space for the cutter to clear. All of the carving was done with a single Onsrud 0.5″ x 2″ cutter length ball nosed bit. Final results. There are some support block which must be removed. Generally this was done on the band saw. Detail of a completed shape. The entire cloak all in order. Ready for sanding and final finish. All of the high spots must have the tool marks removed and made smooth. This was done by hand by enthusiastic Art Department students. Late in 2011, in my capacity as supervisor of The University of Texas at Austin, Texas Performing Arts Scenic Studio I had the opportunity to collaborate with an exceptional contemporary artist, Diana Al-Hadid through the UT Visual Arts Center and Jade Walker. The feature below tell the story of how this came about. It was produced by KLRU, our local PBS station and aired last week. I’m quite proud of the work that I and our Master Carpenter, Kate Vaughn, were able to produce. I’m less proud of my 19 “um”s and “uh”s (as my 13-year-old voice coach Alexis, has kindly pointed out) in the interview. You can watch the video on KLRU’s page.